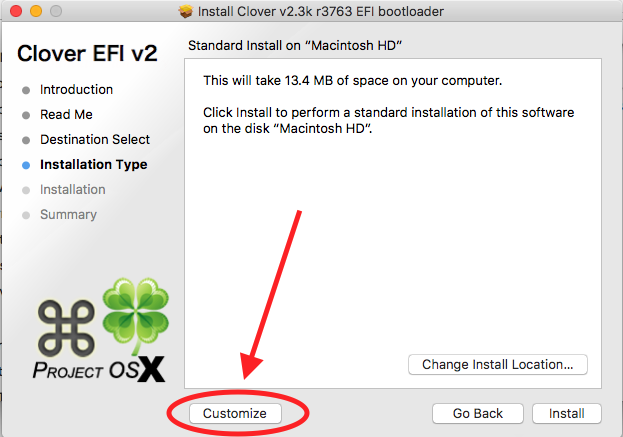 This article is guid for how to tweak BIOS setting, installing macOS and post installation setup with Clover Bootloader for installing Mac OS (X) on PC (Hackintosh) using vanilla method. This tutorial is mainly for PC with legacy BIOS, but just be creative if you’re UEFI BIOS user. [Important!] Before install Mac OS on PC, backup all important data especially in drive that you decide to dedicate for installing Mac OS. Make sure you’ve made a working bootable Usb drive too! You can read HERE for how to make a working bootable Usb drive for Vanilla Hackintosh. Before we start, first make sure to plug your usb bootable drive into your PC. Okay! When everything is ready reboot your PC, and press ‘Del’ key to enter BIOS setting. Then press ‘F10’ key to Save and Exit Bios Settings. Your PC will reboot automatically. It’s time to installing Mac OS, after setting the BIOS your machine will reboot automatically, then it will boot from Clover EFI partition in your Flash drive, because we have set it as first boot device in boot sequence settings. Click or hit ‘Enter’ key to open it. [Important!] Disk Utility in Sierra,EL Capitan, and Yosemite are different. If you want to dual boot with Windows you can add two partition but make sure Mac OS Partition is on top. Close Disk Utilities Select drive you have formatted for Mac click continue, it takes about 15 – 20 minutes depend on your computer speed, when finish your PC will automatically restart. One more time enter into BIOS setting by pressing “Del” key in your keyboard. Wait for Mac OS System to boot for the first time. Then set up your preferred Language, Date and time, internet etc. If you stuck in internet setup just choose “My Computer doesn”t conect to the internet, You can always setup it again later. Setup your User Name and Password. Set your Timezone Information etc, and click continue and continue to finish the setup. When you are lucky, now you should be in the promised land! But wait! don’t get too excite yet! we need to install Clover boot loader, but this time we install clover in the same drive you have install Mac OS in this case the drive is (Macintosh HD). Now for “Post Installation” download the latest version of Clover boot loader. Before you install clover its better to copy config.plist and all kext from usb flash drive. Put it on desktop and then eject usb drive. When finish, close clover installer, and we continue to the final trick. Here is the final trick! 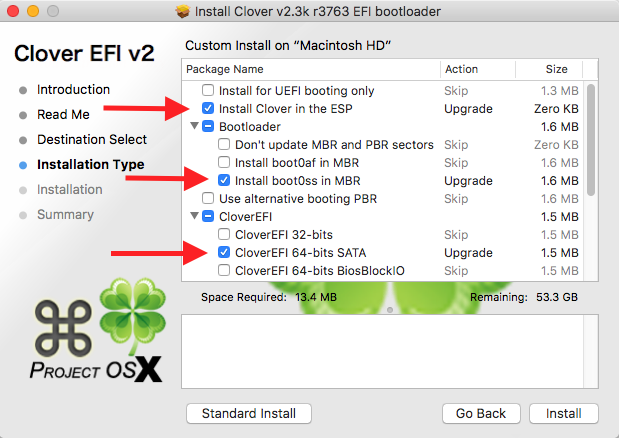 when you finish installing clover, add some essential kext, config.plist etc to EFI Partition. Just exactly the same like when you make macOS installer bootable Usb Drive. But this time to put it in Macintosh HD or whatever you name it. DOWNLOAD or copy config.plist that you have copied from usb installer in your desktop earlier. 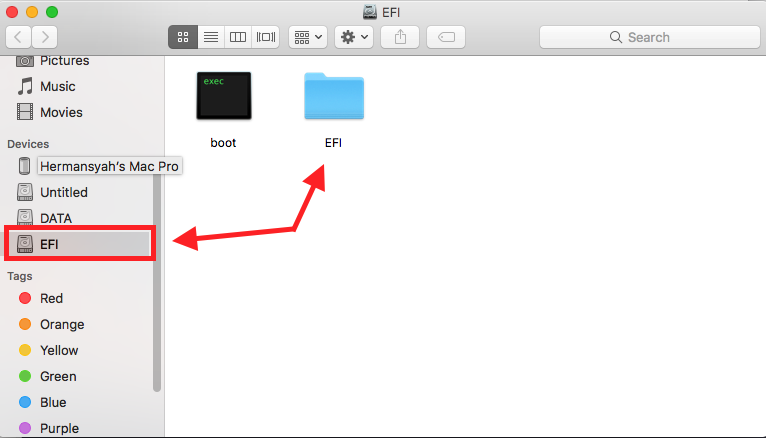 And paste it to mounted EFI partition in finder-sidebar click on EFI > Clover > EFI > CLOVER and replace existing config.plist there. Also copy all kext to Clover > EFI > CLOVER > Kext > Other (for OS Sierra) 10.11 (for El Capitan) and so on. When done restart PC and one more time enter BIOS setting, set Drive that has Mac OS installed as 1st boot device in Boot Sequence settings. Save and exit BIOS setup. Once again your PC will automatically reboot. And.. congratulation! now you are ready to fly on. You may now want to customize your new Hackintosh. Yeah! sometimes things won’t work like it should be. So if you face with problem while boot from usb installer, this may solve the problem. In Clover boot screen, instead of hit ‘Enter’ key on Mac OS X Base System (Installer partition) use the ‘Space’ key, it will open this page. If you want to see what is going on behind the Apple boot logos, you can also check for Verbose with this option you can see what the problem occur. Make sure to unplug any external devices such as wifi adapter, Ethernet, another usb drive beside usb installer etc. For conclusion and you to taking note! that every Hackintosh thing is only for FUN and Educational purpose only, If you really love Mac OS X system you should buy a Real Mackintosh by Apple. Special Thanks to: myhack.sojugarden.com & osxarena.com for such inspiration how to make a clean and safe vanilla hackintosh.